Children can be overwhelmed with gooey chocolate and sticky candy during the Easter holiday. This can be detrimental to their overall health and hurt cavity-fighting efforts. Dentists in SW Portland Dr. Todd Beck and Dr. Jacob Morrows and the staff at South Waterfront Dental encourage patients of all ages to avoid processed food that is high in sugar and fat. Unfortunately, this describes most Easter treats found liberally this time of year. However, with a little creativity and resourcefulness, you and your children can enjoy healthy and wholesome Easter snacks during this holiday! Here are some helpful tips. What food does a bunny eat? Carrots, of course! 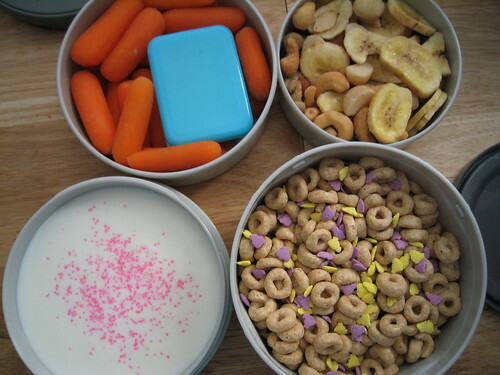 Encourage your kids to eat like a bunny and grab a bunch of cut or baby carrots. Set these out for kids to munch on along with a variety of foods and condiments to use for dipping. Provide small dishes of salad dressings, hummus, peanut or almond butter, or spinach dip and let the healthy snacking begin. Get in the pastel spirit of the season with small bagels and a variety of cream cheese. Strawberry cream cheese, for example, will already be pink in color. For additional pastel colors like yellow, blue and lavender, add small amounts of food coloring to plain or flavored cream cheese and serve them in separate bowls. Help your kids toast bagels and have them spread the colored cream cheese to decorate their bagels! Now that the eggs have been found, it’s time to turn them into a healthy and colorful snack! Peel the decorated eggs and make them into a delicious egg salad, served with toasted bread and pita chips along with garnishes of carrots and celery for extra crunch. If you choose to make egg salad sandwiches, consider using an Easter-themed cookie cutter to make those sandwiches into fun shapes like Easter eggs, bunnies, or flowers. Set them out for kids who are too distracted by Easter fun to sit down and eat lunch. If your family isn’t a fan of egg salad, try peanut butter and jelly or turkey and ham instead. The hard-boiled eggs can be used in another way – deviled eggs are delicious! Dentists in Portland OR Dr. Todd Beck and Dr. Jacob Morrow and their staff at South Waterfront Dental encourage patients of all ages to make healthy food choices for the best possible dental health. Call 503-841-5658.